For a typical classical piano concert, one would imagine a single grand piano with its lid open, its brilliant inside encased in silky, heavy blackness. Sometimes, there are two pianos — there are a handful of orchestral and chamber two-piano favourites that are programmed regularly. But six pianos? 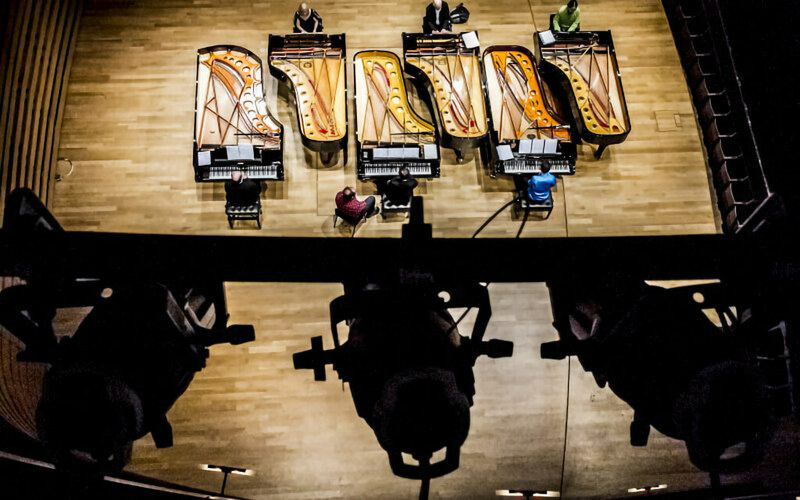 On October 12, 2018, 6 Steinway concert grands will fill out the Koerner Hall stage, under the Soundstreams’ season opener: Six Pianos. Featuring a mix of Toronto pianists and percussionists: Russell Hartenberger, Ryan Scott, Greg Oh, Jamie Parker, Stephanie Chua, Midori Koga and Radka Hanáková, the program is built on Steve Reich’s Six Pianos, and features John Cage’s The Beatles 1962-1970, along with smaller scale multi-piano works (Lutosławski, Alexina Louie, Juliet Palmer), and a newly commissioned work by virtuoso pianist/composer André Ristic: Variations on Vivaldi. The logistics for such a concert is quite different from the norm. 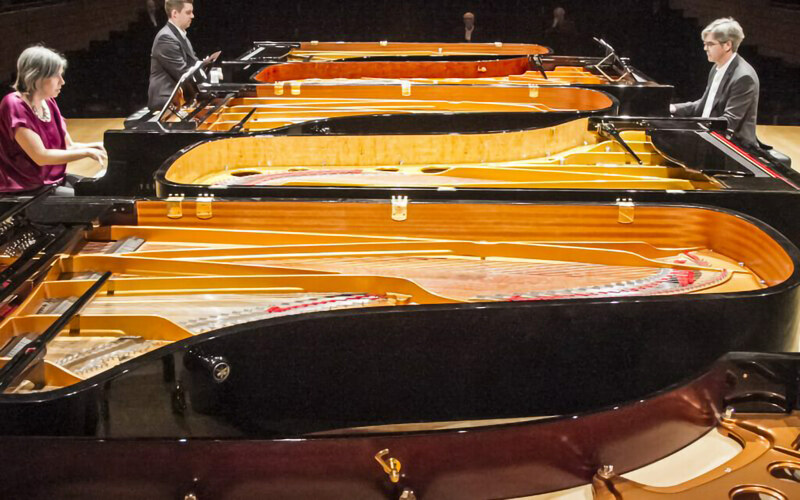 As most concert halls have just two pianos (larger international halls may have up to four, often varying in size), the main challenge lies in sourcing the pianos that can be matched successfully. 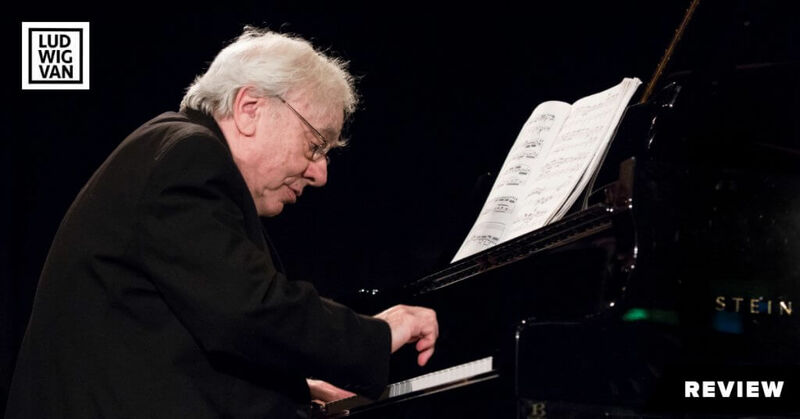 Luckily, Steinway Piano Gallery, Toronto, is providing six concert grand pianos; the rehearsals for Reich are taking place at the Steinway Piano Gallery in Markham. 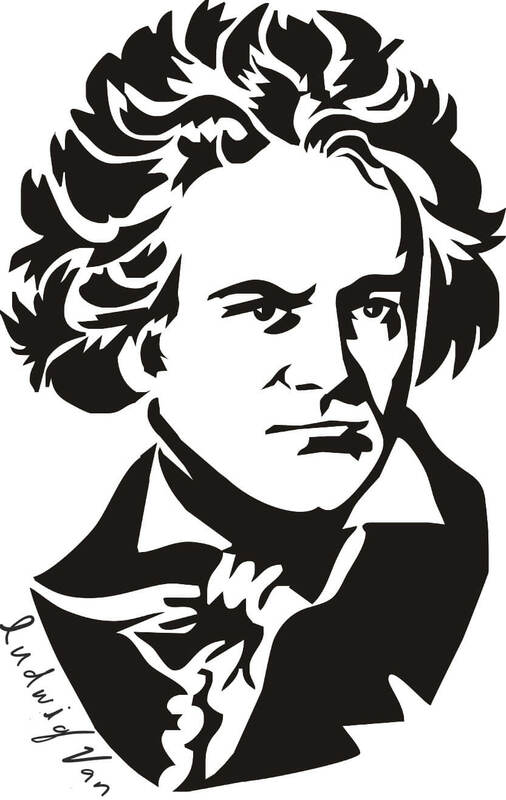 And how do pianists feel about the piano-exclusive ensemble format? Most pianists work alone, or in chamber groups consisting of other instruments. 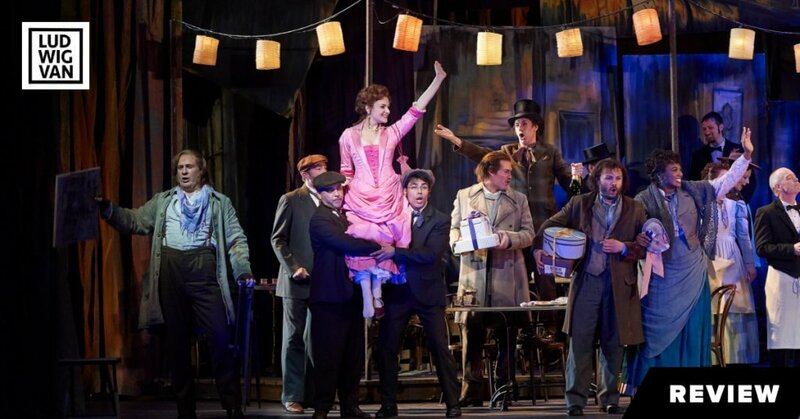 Even in professional musical training, while string, wind and brass instrumentalists are placed in appropriate large ensembles, (guitarists are usually sent to guitar ensembles) and vocalists into choirs, pianists — well, they are usually sent to choirs (even if the pianist has never sung and does not want to sing), as multi-piano ensembles are quite rare, even professionally. 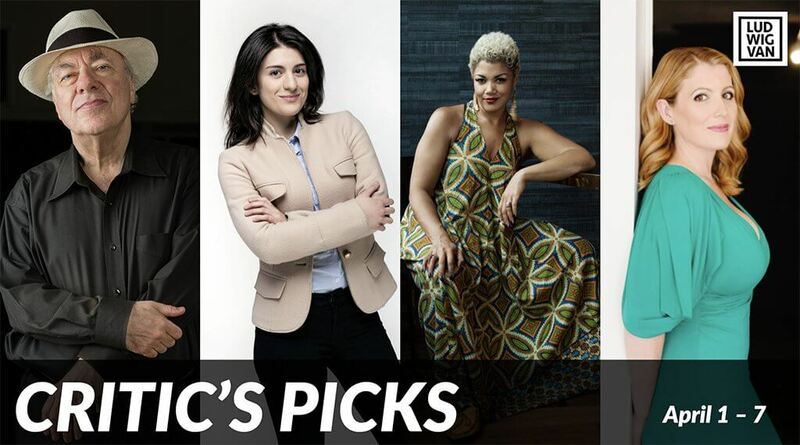 There are only a handful of 4-piano quartets and 6-piano groups in the world. Midori Koga and Jamie Parker, and percussionists Russell Hartenberger and Ryan Scott, will be joining Stephanie and Greg on the pianos for SP. For companion pieces, Soundstreams chose Cage’s The Beatles 1962-1970 (1989), one of the few original compositions for 6 pianos, full of quotes from popular Beatles tunes, Lutosławski’s Variations on a Theme by Paganini (1941), and Louie’s Afterimages (1981), to reflect the old, and Palmer’s Five (2008), written for Greg’s eclectic ensemble, Toca Loca, and Ristic’s new commission work, Variation on Vivaldi (2018) for six pianos (Radka Hanáková will take Russell’s bench), to represent the new. 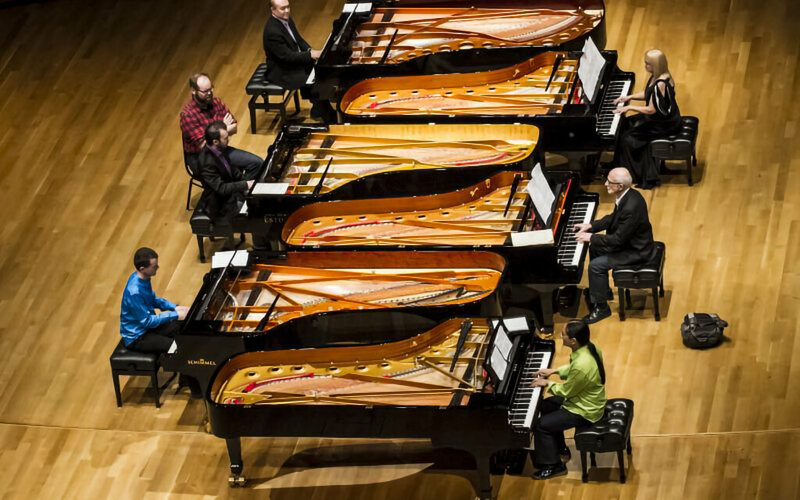 Set for six pianos, with six pianists, there will also be a big nod to Reich in the music — through repetitive techniques such as phasing, chord repetition and unison canons- an homage from André.